Following its mission to create a stimulating, developmentally appropriate learning atmosphere for young children in a natural, beautiful space, the Child Educational Center in La Canada, California, recently opened its new certified Nature Explore Classroom. Playing in piles of leaves in the Nature Explore Classroom provides fun while giving children a chance to touch, smell, and explore nature first hand. The Nature Explore Classroom is situated inside the Center’s preschool yard, which serves more than 80 children per day. The Classroom enhances the Center’s research-based curriculum and caregiving approach that is designed to meet the emotional, physical, and cognitive needs and interests of children. Children use the yard for 8–10 hours a day each day, so the goal is to give it the feel of a backyard-homey and familiar-and the Nature Explore Classroom areas were designed to reinforce this theme. 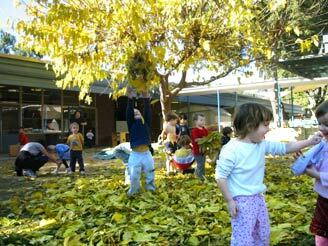 Nature Explore Classroom activity areas are divided by natural and man-made boundaries with lots of wide open, natural space that invites children to run and play. Activity areas include a Climbing Structure Area-which includes a crawl-through log-on a cushioned Fibar surface, a Climbing Tree Area surrounded by wood chips, and a Log Building (Messy Materials) Area under an oak tree, where children can build with logs, tree limbs, tree stumps, tree rounds, and rocks. Other areas include Block Building, Nature Art, Music, Sand, and Garden Areas. 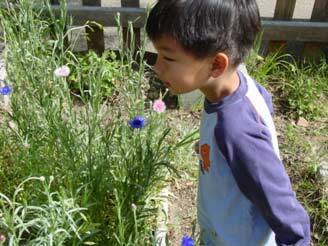 Abundant trees, flowers, shrubs, and grasses add varying smells, textures, colors and sizes to the Classroom. The Child Education Center’s Certified Nature Explore Classroom is the first to be constructed in California and fourth to be certified in the nation. Redesign of the yard included taking down a garden fence to give children more access for exploration and investigation. More than a dozen large trees-including California Live Oaks-provide abundant shade for activity and play areas. Planted areas around the yard give children hands-on opportunities to learn about flowers, herbs, and vegetables. To help guide the design of the yard, the Center’s landscape architect has observed and talked with children to learn what works and doesn’t work. Parents and the community have helped accomplish the work involved in redesigning the yard. Connecting children with nature through personal experiences and exploration are at the heart of the Nature Explore experience at the Child Educational Center. Native grasses help create borders between Nature Explore Classroom activity areas in the preschool yard at the Child Educational Center. Fun, colorful instruments in the Nature Explore Classroom Music Area entice children to create interesting sounds.